The title of this post has honestly never been more true. You guys, I HAD SUCH A BUSY/CRAZY/INCREDIBLE week. Writing in all capitals can't even explain how tiring and exciting it has been. Let's first start out with why I've been so absent from Twentyapolis. On Sunday morning, I flew to Orlando for a busy few days of tradeshows, media events and a million other things for work. Unfortunately, Twentyapolis had to fall to the wayside for a few days. On a side note, while there, I WENT TO THE WIZARDING WORLD OF HARRY POTTER. Seriously. It's very safe to say that being there was one of the most magical (no pun intended) experiences of my entire life (remember, huge Harry Potter fanatic here). I flew home on Thursday evening and have been recovering (trying to get as much sleep as possible) ever since. In addition to traveling and working, I've been pretty busy lately. I had an Arbonne spa party with a few of my girlfriends at my apartment and ordered a few incredible spa products (more to come on those!) I found my new favorite ring. I also went shopping and found my favorite new bag (see below!) I went to David Yurman and drank champagne...IN DAVID YURMAN. Needless to say I added and crossed that off my bucket list that very day. On Friday, I went to the dentist. Even more impressive? I went to the dentist at 8 a.m. Yes, ladies and gentlemen, I am on my way to being a full-on adult. I also went grocery shopping. And instead of buying groceries only, I splurged on (very on-sale) pillows for my couch and bed. I also bought matching mugs for Jack and I for our VACATION. Yes, this coming November, we will be Mexico-bound! We really need a vacation. On that thought, we also chose a resort in Mexico. On Saturday, I got all dolled up and attended a Founders' Day brunch for my sorority. 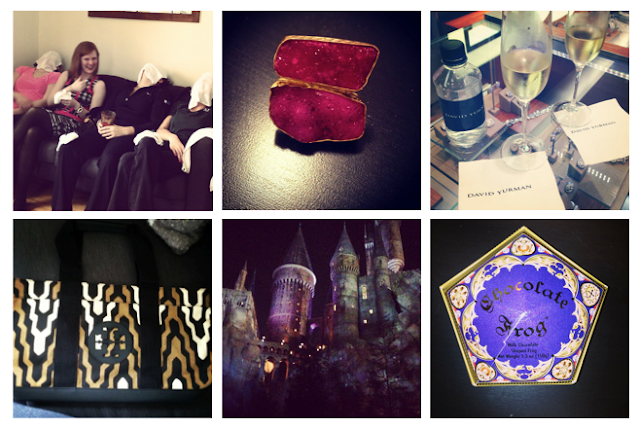 I watched three of the Harry Potter films, cleaned my apartment and blogged, finally! On Sunday, I hope I sleep.